He did it! He left the house at 6:20 AM and returned at 4 PM. Hubby, after being so, so, sick has made it back to school. His first stop after heading in the door? Off with the tie, off with the shoes, and into the warm bed for a nap. One day down. I couldn't figure out what to do with the extra time by myself. Sew? Bake? Clean? I mostly sat in the recliner and watched the snow fall, then when the sun broke through found my way to the bed for a little rest. 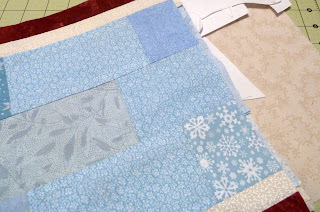 I did spend a teeny tiny bit of time sewing my next project, a snowman table runner.